In 2004 in the city of Mar del Plata, in the province of Buenos Aires, with a total of 700,000 inhabitants, a program on Domiciliary Care was created, to teach on the subject of elderly, disabled and chronically ill. Something new for Argentine society: to think and learn about the elderly and the representation of old age. During the years that the classes were given under the program, different students with different knowledge attended, some were not in school, others had professional training. It was not until 2009 that the concrete idea of ​​being able to put together a cooperative group with the students appears. In the “pre-cooperative” period, the task to be developed by the cooperative was to teach to more than 200 people interested in the subject. Approximately 120 applicants received a work experience provided by the Cooperative, with previous evaluation of their conditions and work history (note the age of the caregivers, mostly women between 40 and 55 years). 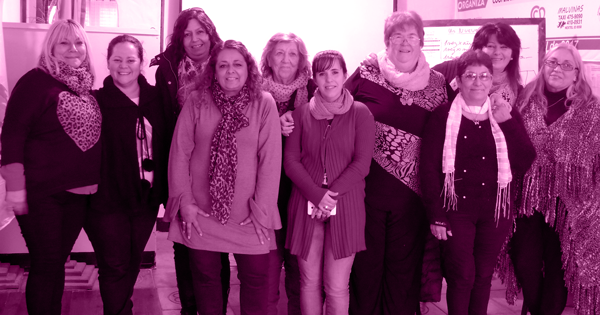 The Mar del Plata Limited Homecare Workers Cooperative was born on January 6, 2012. At this moment the cooperative has 123 members, all of them have a job, they achieved this with a lot of effort, and without external economic resources. The Cooperative receives requests for home care from different health organizations, geriatric doctors and family recommendations. The training of domiciliary caregivers allows to solve a social, sanitary and cultural demand. The caregiver supports the medical teams, covers hours of solitude by providing company, applying techniques to avoid dependency, preventing accidents and helping the disabled. Fecootra since 2014 is working on this problem and exchanging mainly with the Social Cooperatives of Italy in the Trieste region and with the Cooperatives of the Mondragón de Euzkadi Group (Basque Country). The local states are committing themselves to the progress of these initiatives, since the problem arises with more urgency because home care is increasingly required by a population in which life time extends.